My husband told me yesterday about the Up inspired house that they created for the upcoming National Geographic Show called, "How Hard Can It Be?" which debuts in the fall. Would you be brave enough to go for a ride in a real live Up House? 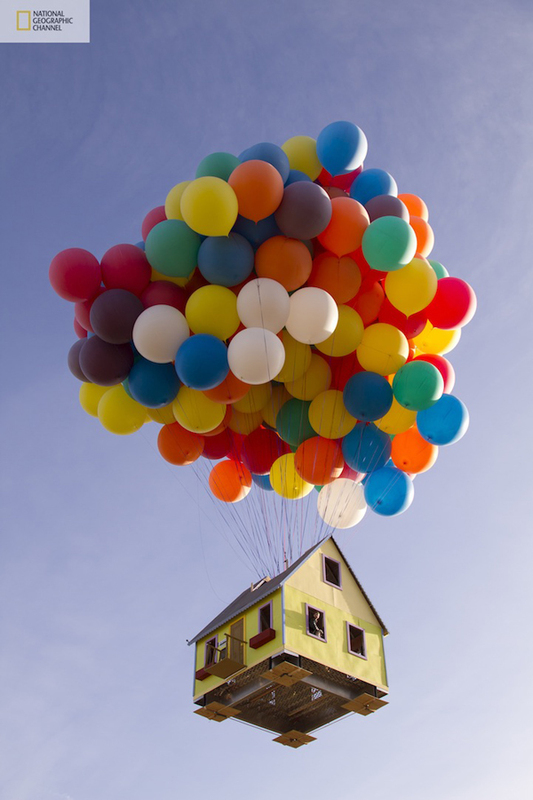 The talented team launched the house on March 5th and it flew for about a hour, and they even broke some world records for flying really high. I personally wonder how they were able to land it, ha... isn't this awesome! I can't wait to see the show and this episode when it airs. It's so cool they did this. Making science fun! I can't wait to watch the episode too! This was the best thing I'd seen in a while! I didn't think a real "Up!" house could be possible! This is amazing! That is awesome!! Amazing pictures too! Looking at these pictures continues to make me smile. Isn't this the wildest thing? I posted it on my Facebook page this morning too! but how do they get it down? a bb gun perhaps?